Richard Vallance and other archaeological-minded individuals whom I follow on Twitter, and who have spent time on Crete, have assured me that the image has not been photoshopped, that it IS snowing at Knossos, and that this phenomenon happens very rarely. This isn't the first year in recent memory that snow has fallen in the Aegean and eastern Mediterranean. Snow fell on the pyramids of Giza last year, and in Jerusalem. We attribute it to climate change, whether man-made or no. 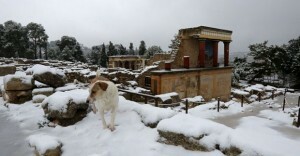 Knossos may very well see more snow in the coming years. Of course, that got me to thinking about the Minoans. It's certainly odd to imagine the sun-loving Minoans dealing with snow, but as the Minoan period lasted from about 3000 B.C. to 1450 B.C. when the Mycenaeans took over Crete, snow must have fallen on the lower elevations at some point back then. Global temperatures would have dropped worldwide after the massive Thera eruption, much more powerful than the 1815 Tambora eruption that caused the infamous Year Without A Summer. And there was climate change at the end of the Bronze Age, around 1200-1100 B.C. There were periods of drought, which we know about from tree-ring and ice-core samples, and from Hittite, Egyptian, and other, contemporary sources. So for those of you readers and budding authors who still insist that Minoan women went around bare-breasted year-round, here's some serious food for thought. Weather is a thing that happens.